Have you been trying to regrow hair in Southeastern Massachusetts and have not gotten the results that you desire? 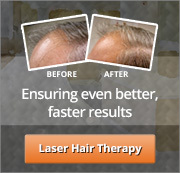 Have you gone from one Boston hair loss clinic to another with no avail? Don’t give up on having that full head of hair that you once enjoyed in your youth. Dermal lens hair from Virtual Reality might just be the solution that you have been looking for all along. While some men will respond to treatments, such as our New Bedford laser hair therapy, shampoos, and other Corrective Hair Solutions, others may seek instant results through the Virtual Reality dermal lens hair program. Unlike a traditional hairpiece, Virtual Reality becomes a part of you. It’s not something you put on or wear – like a hat – but it is applied cosmetically by our team of highly trained technicians. Don’t let hair loss win. This non-surgical technique involves the application of an invisible dermal lens, which is kind of like a contact lens that has had real human hair inserted into it. The hair matches your own natural hair’s color, texture, length, and style. We can even match your natural curl pattern and density. This provides an appearance that is totally natural and helps you to feel like yourself again in just one visit. The best part of the Virtual Reality dermal lens hair at our Greater Boston hair loss clinic is that it is maintenance-free. All you need to do is wash it, condition it, and style it as you would normally style the rest of your natural hair. Visit South Coast Hair Options to learn more about how this treatment works, which allows you to “regrow hair” in Southeastern Massachusetts, even if nothing else has worked for you in the past. This solution works for every single client, as our technicians completely customize the experience based on your unique needs. At South Coast Hair Solutions, we start every consultation with a complete scalp evaluation. You never know, you could be a candidate for our New Bedford laser hair therapy, which can be used in conjunction with a dermal lens hair solution. When you visit our clinic, we will examine everything, from the pattern of your thinning hair and hair loss to the rate of hair loss, the thickness of your existing hair, and your lifestyle needs. We know that there is no one-size-fits-all solution for hair loss. Some hair loss is genetic, while others might have other causes. We tailor a program that is designed specifically for you and your needs. Depending on the cause of your hair loss and your immediate needs to get a full head of hair, there are a couple of options that may work in your situation. We use the Corrective Hair Solutions (CHS) approach, which is different from other treatment programs in the local area. Every single CHS solution provided to our clients is based on your needs. While your friend may have had luck with a bottle shampoo treatment bought at the local mega mart, your hair loss is likely very different. We have a variety of solutions that can be used, sometimes as a standalone treatment, and other times in conjunction with another course of action. Men who have thinning hair at the crown area require different treatments than men who simply have a receding hairline. Men who have hair loss in the temple area won’t be helped by a solution that covers up their existing hair. This is why the dermal lens hair approach is so popular at our Greater Boston hair loss clinic. Even though the general treatment will work with every client, the way that it is applied and used to your advantage will likely be greatly different from our other clients. Corrective Hair Solutions is based on a series of individualized solutions that are unique to your hair loss condition. If you are interested in determining if you can regrow hair in Southeastern Massachusetts or if you want to learn more about the Virtual Reality dermal lens hair solution, make sure to stop by South Coast Hair Options or at least give us a call. Our technicians can answer any questions that you might have about our approach to male pattern baldness and thinning hair in men. Our New Bedford laser hair therapy treatment is a pain-free, simple solution that can benefit many of our clients. However, the treatment plan chosen for you might be somewhat different. The only way to know what will work for you is if you come to our clinic for a FREE scalp evaluation. Once our team gets a look at your scalp and learns more about your hair loss experience, we will be able to suggest the best treatment program available to suit your type of hair loss, the rate of hair loss, lifestyle, and budget. Call today at 508-995-7085 and schedule an appointment so you can get started on the journey to regrow hair in Southeastern Massachusetts and get back to that full head of hair that you once wore with pride.